Need all the bells and whistles? MoneyWorks Gold has all the features of MoneyWorks Express plus cost centre accounting, multi currency, job costing, advanced inventory management and much more – all in one place and all fully integrated. To add networked access, see MoneyWorks Datacentre server. Integrated cashbook, general ledger, receivables and payables. Powerful subledger capabilities, allowing departmental/cost centre reporting and budgeting. Send and receive invoices or payments in any currency. Enter quotes, sales orders and purchase orders and manage deposits, backorders and shipping. Store product images and barcodes, manage multiple pricing and discounts. Manage inventory and manufacturing. Track serial and/or batch numbers across multiple warehouse locations. Automatically collate time and disbursements for billing. Customise any of the supplied reports, or create your own. Per-user privileges and general ledger security levels protect your vital accounting data. Customise MoneyWorks or add your own features using the built-in scripting and window design system. Integrate MoneyWorks with other key systems for streamlined workflow and greater productivity. Extend the functionality of MoneyWorks to meet your special requirements. With MoneyWorks, you have the choice of buying a licence, or subscribing to one, or a combination of both. Every month from that date, your credit card will be automatically charged for the next month's subscription. A subscription will cover any updates and upgrades released while the subscription is current, but does not include support (which will be charged separately). Note that, with subscriptions, MoneyWorks will occasionally check back to our server to check your subscription status. For this reason you need to have internet access every ten days or so. If you suspend your subscription, or otherwise don't pay, your MoneyWorks will stop working. Simply renew the subscription for continued access. 1Your credit card details are held securely by our payment gateway supplier, DPS. YOUR USE OF AND ACCESS TO THE WEBSITE AND PRODUCTS AND SERVICES AND ASSOCIATED SOFTWARE (COLLECTIVELY, THE "SERVICES") OF COGNITO SOFTWARE LTD ("COGNITO") IS CONDITIONED UPON YOUR COMPLIANCE AND ACCEPTANCE OF THESE TERMS. "YOU" (AND "YOUR") IS THE INDIVIDUAL WHO IS USING OR ACCESSING THE SERVICES OR PRODUCT, AND/OR WHO HAS PAID FOR THE SERVICES OR PRODUCT, OR, WHERE AN INDIVIDUAL IS PURCHASING THE PRODUCT ON BEHALF OF AN ENTITY, THEN THAT ENTITY. By clicking/checking the "I have read and accept these terms and conditons" checkbox or equivalent, accessing the Cognito website or by using the Services You agree to be bound by these Terms and Conditions. The Services may not be accessed by persons who are not legally eligible to be bound by these Terms. The MoneyWorks Subscription Service ("Subscription") provided by Cognito is an online service which gives access to one or more designated MoneyWorks software products ("Product") for a limited time period ("Period"). The Subscription provides You with a non-transferable, time expiring licence to use the Product. At the end of the Period the licence will expire and You agree to either renew or cease using the Subscription. Continued use without renewing the Subscription is forbidden. To access the Services You will need to provide information about Yourself. You agree that any such information shall be accurate. You will also be asked to choose a user name and password. You are entirely responsible for maintaining the security of Your user name and password and agree not to disclose such to any third party. Access to the Product is provided by an Access Serial Key ("Serial"), and requires regular access to the internet. You agree that You will not disclose the Serial to any third party whatsoever. You further agree not to disassemble, reverse-engineer or in any other way attempt to modify the Services or the Subscription management process, or to attempt to bypass any controls on the Services. Any software associated with the Services and website is protected by copyright laws and international copyright treaties, as well as other intellectual property laws and treaties. Cognito will charge You, and You agree to pay, the listed price for the Subscription. This will be automatically charged to Your credit card or other payment mechanism selected by You and approved by Cognito (your "Account"), on a monthly basis. Cognito reserves the right to vary prices for the Subscription at any time, including charging for a Subscription or Product that was previously free, and will notify You by email at least 30 days in advance of a price increase. Your subscription provides access to the Product only, and not to any support or other services. Should You require support or assistance from Cognito in any form, You agree that Cognito can, at its sole discretion, charge your Account for the support provided at Cognito's then current support rates. You may suspend or terminate your Subscription at any time. Suspension or termination by You comes into affect at the end of the Period. In the event of Cognito becoming aware of abuse of any aspect of the Services by You, including but not limited to failure to pay, Cognito has the absolute right to immediately suspend Your access to the Services without prior notice. Your use of the Server and Product is entirely at Your own risk and Cognito provides no warranties as to the Services. Without limiting the foregoing, Cognito does not warrant that the Services will meet Your requirements, or that the Services will be suitable for any particular purpose, or that the Services are secure, free of bugs or viruses or interruptions, or that Your use of the Services will satisfy or ensure compliance with any legal obligations, laws or regulations. To avoid doubt, all implied conditions, and warranties of the Services are excluded insofar as is permitted by law, including, without limitation, warranties of merchantability and fitness for purpose, performance, accuracy and quiet enjoyment. To the extent not prohibited by law, in no event shall Cognito be liable for personal injury, or any incidental, special, indirect or consequential damages whatsoever, including, without limitation, damages for loss of profits, loss or corruption of data, business interruption or any other commercial damage or loss arising out of, or related to the Your use, or inability to use the Services, however caused, regardless of the theory of liability (contract, tort or otherwise). The Services, including the MoneyWorks Software, is owned solely by Cognito, and nothing in these terms grants You any ownership. Data files that You create using MoneyWorks belong to You, and You are responsible for their care and backup. You need to provide Cognito with email addresses and other information in order to access the Services. Cognito agrees to hold this information private and not to disclose it to any third party whatsoever, unless required to by law. You agree that, as part of this subscription, Cognito may email You from time to time about the Services, MoneyWorks or related software/services. Cognito reserves the right to change the Terms and Conditions at any time, and will advise You of such changes by email or such other means as may be appropriate. Your continued use of the Services indicates Your acceptance of any changes. Cashbook, for recording payments and receipts. Free form multi-dimensional general ledger (extended by cost centre/departmental accounting in Gold). Powerful reports and on-screen enquiries. Forms designer, to create or modify invoices/statements/labels etc. The powerful subledger capabilities of MoneyWorks Gold allow for departmental/cost-centre accounting and budgeting. A department might be a branch, salesperson, vehicle (for fleet management), curriculum area (for schools), project, building (property management) etc. Easily create new departments, group them and classify them. Each department is represented by a set of sub-ledgers in the chart of accounts, allowing for precise coding, reporting and budgeting. Creating a new department automatically creates all subledgers required. Report by department, department classification or consolidated group of departments. Most standard reports can be run for a selected department, group or classification, giving you instant departmental reporting. Link departments to products and inventory for product sales analysis by salesperson/branch etc. Use departments as cost centres in the job system, to better monitor job revenue and costs. Reconcile departmentalised accounts using the standard MoneyWorks bank reconciliation. Prepare and manage quotes and estimates. Enter quotes and estimates, and see line by line costs and margins. Print or email quotes/emails on the pre-supplied forms, or create your own. Print professional quotes with product images for greater impact. Convert accepted quotes into sales orders or jobs. Customise the quote forms or create your own with the Forms Designer. Manage sales orders, backorders and shipping. Record and manage deposits on orders. Part ship sales orders if insufficient stock; MoneyWorks will handle the backorders. Print delivery notes, picking lists, mailing labels, product labels and shipping labels. Automatically create invoices when items ship or as services provided. Handles both cash and invoiced sales. Create purchase orders in any currency. Reduce overstocking by automatically generating required purchase orders from selected sales orders. Implement order approval using validations, scripts and custom forms. Print/email purchase orders on the pre-supplied forms, or create your own. Easily manage deposits and pre-payments on purchases. Process goods arriving before, with and after the invoice. Process orders in full or in part, with automatic backorder handling. Store details of commonly used products or resources, including long descriptions and product images. Have product codes up to 31 characters long. Handles non-reducing items with standard costs (such as labour), or fully inventoried items. Attach sticky notes that can appear whenever the item is purchased or sold. Store usual supplier and their product code for easy re-ordering. Store product barcode for use with scanner when selling or purchasing items. Print reports (such as product catalogue) that include barcode, product images and other information. Analyse sales or purchases by product or group of products. Multiple product prices: Have up to 6 prices for each product and record the price code for your customers. Pricing can be tax inclusive or exclusive, discount or cost plus, with additional customer and product discounts available. Up to 5 price breaks automatically selected by the sale quantity. Print individual customer price lists, based on price code and customer discounts. Selling too cheap alerts: When entering product prices, MoneyWorks will call-out sell prices that are below a specified markup or margin. MoneyWorks Gold also has full inventory management, including serial/batch and location tracking. The MoneyWorks stock system is fully integrated with order entry and the job system, making stock management easy. Track inventory levels, values and cost of goods with full audit trails. Manage inventory across different locations/warehouses. Keep track of serial numbers and batches (with optional exipring dates) for items. Automatically update stock levels when inventoried items are purchased or sold. Purchase and stock in different units (e.g. purchase by case, sell by the bottle). Allow negative stock and do automatic cost of sales adjustments when replaced. Perform stock adjustments (create, write-off, revalue, assemble, disassemble, transfers) with complete audit trail. Detailed inventory reporting, plus analyse ordered or committed inventory. Flexible stock take facility to easily manage either full or rotating physical stock takes. Warnings given when preset stock levels are reached. On-screen inventory analysis gives complete stock information. 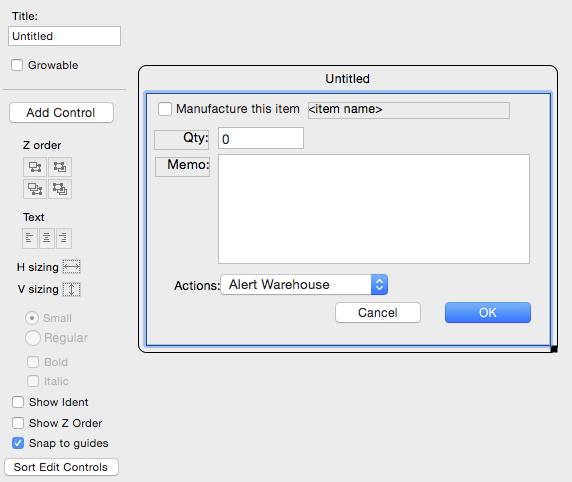 Automatically create purchase orders for low or out-of-stock products. Stock history report shows historic inventory levels and valuations. Manufacture finished products from bill of materials. Annotate components on bill of material to aid assembly. 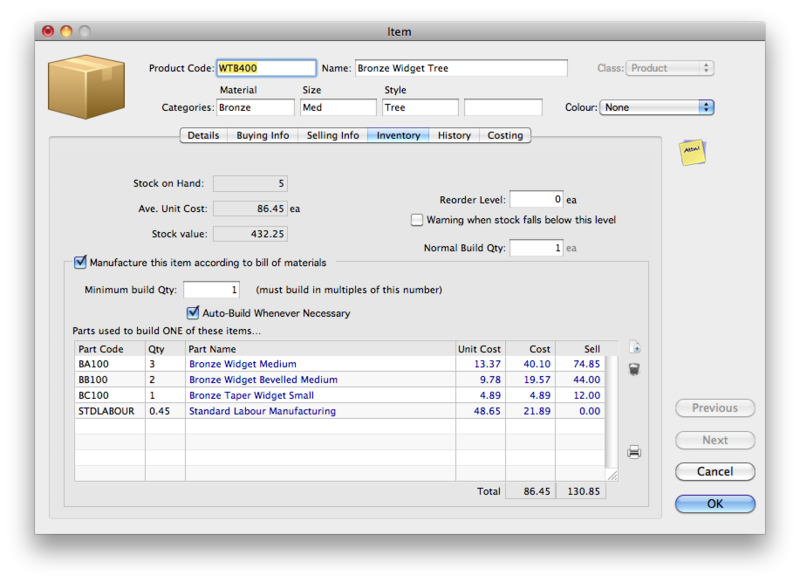 Auto-build items when stock level falls below specified minimum. Bill of materials supports inventoried, labour and other non-stocked resources. Bill of Materials report for manufactured stock items. Manage jobs, create budgets, trap job expenses, and bill jobs. Automatically collate time and disbursements for billing. Create jobs and subjobs, either quoted or cost-plus. Prepare job budgets from quotes. Record time, disbursements and resources used for individual jobs. Automatically trap disbursements against jobs (and apply markups) when recording cash expenses or creditor invoices. Manage stock requisitions for jobs. Import job/time sheets from other applications (Excel, FileMaker Pro, Access etc). Automatically prepare itemised or summarised invoices from job sheets. Use job reports to accurately gauge your profit/margin. Determine costs and revenue by job, and compare to budget. Print complete schedule of all cost components of jobs, organised by resource, cost centre, account or activity. Use cost centres to monitor job activity. Complete job analysis & reporting. Automatically journal work in progress at month or year end. Issue and receive invoices/payments in any currency, and MoneyWorks will do the background accounting. Set up any currency in MoneyWorks. Create an unlimited number of foreign currency bank accounts. Assign currency to customers and suppliers. Enter orders and invoices in any currency. Maintain receivable and payable balances in the original currency. Handle invoice payments/receipts in different currency from invoice. Transfer funds between different currency bank accounts at a nominated rate. Automatic management of realised and unrealised currency gains/losses. Per period currency rates for each currency with transaction override as needed. Script available for automatic exchange rate updates. MoneyWorks Gold/Datacentre include a powerful, built-in report writer. 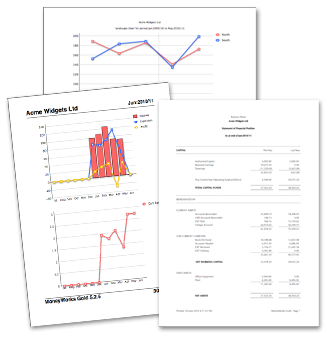 Create detailed reports to give exactly the information you need in the format you choose—no need for expensive add-ons to present your information how you want it. Modify any of the supplied reports1, or create your own. Simple graphical design tools allow easy creation of general ledger type reports, but with the power to use any data in your database. Generate charts (pie graphs, line and column, stacked bar charts) to better explain your data. Report Signing and Privilege Control secures access to sensitive data, so only authorised users are allowed to use the report. Reports can be based on any data in your MoneyWorks files, and not just the general ledger. Use Excel-like formulas and functions in your report to make complex calculations, including access to internal variables, database lookups and built-in functions. Access other data sources, including other MoneyWorks Datacentre files, from within a report. 1. some audit reports are non-modifiable. Fast network access allows multi-user access to your MoneyWorks Gold accounts file. Easily share your accounts on a Local Area Network. MoneyWorks Gold employs a host-guest networking model, and doesn't require a server. The master user opens the accounts hosted on their machine, and multiple guest (client) users can connect. MoneyWorks networking performance is typically many times faster than competing products. Software performance can make a big difference to staff productivity. Advanced database allows simultaneous access to the same functions (e.g. Accounts Receivable) by multiple users. Mix Macs and Windows PCs on the same network, all with simultaneous access. The host-guest networking model in MoneyWorks Gold is not suited to running off a server. If you want to host your accounts on a server you should look at MoneyWorks Datacentre. Create login profiles for each user based on their role. Restrict access to operations using the extensive per-user privilege controls. Restrict access to sensitive general ledger accounts, such as payroll, using account and user security levels. Provide read-only access to designated users. Access to reports is automatically determined by a user's privilege. Sign reports and forms to further restrict access to nominated user(s). Audit trails keeps track of, for example, who entered which transaction. Use mwScript to enhance security to meet unusual requirements. Use SSL protocols for secure network connections to MoneyWorks Datacentre over the internet. Import bank statements with auto-allocations. Configurable importing for transactions, names, items, accounts using Copy/Paste into lists, or the File>Import command1. Export from all main database lists using Copy or the File>Export command1. Import/Export data as tab delimited text or xml. Use mwScript, the powerful MoneyWorks Gold scripting language, to format data into virtually any format. Ensure interoperability with the other systems your business relies on. Use report scripts (developed in MoneyWorks Gold) to automate tasks. Send reports direct to Excel, Numbers (Mac), pdf or text file. Automate data transfer using Applescript (Mac) or Visual Basic (et al) via COM (Windows). Live-link your Access or FileMaker databases to MoneyWorks to streamline your workflow. Create scripts in the VBA layer of Excel to exchange data with MoneyWorks. Use mwScript in MoneyWorks Gold/Datacentre to automate tasks and retrieve data from other sources. Use the REST APIs in MoneyWorks Datacentre to access your accounts from other systems, even across the internet. 1The file Import and Export commands are not available in MoneyWorks Cashbook; instead use Copy and Paste to transfer data through the clipboard. Extend MoneyWorks with the built-in scripting language and user-interface builder. The MoneyWorks window builder allows you to create new list views, entry windows and alerts, and even add new fields to some existing entry windows. Create custom windows to streamline your workflow. Use webviews to display data from websites, or access clever web-based analytical tools such as google charts. 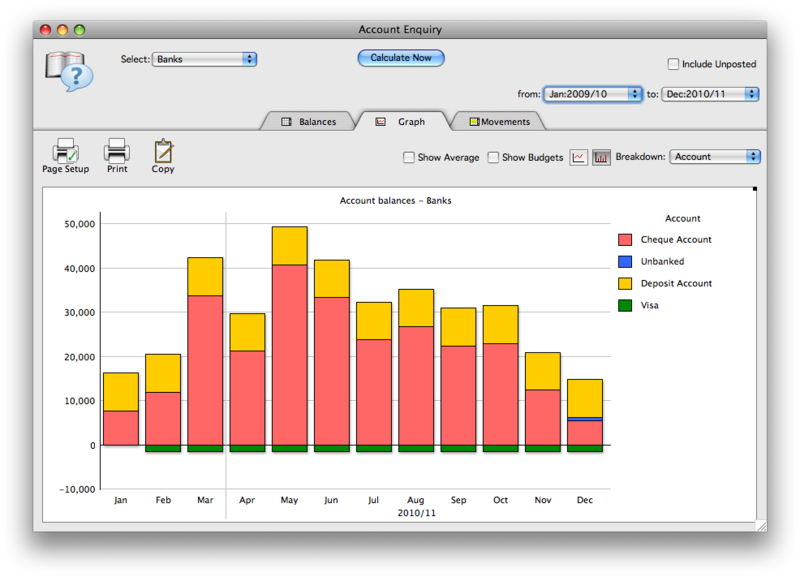 Display and edit data within MoneyWorks from other sources, such as SQL databases. Use "overlays", to extend transaction entry windows. These windows can be fully controlled (open, closed, field validations etc) using MoneyWorks scripts. MoneyWorks Gold/Datacentre have a powerful built-in scripting system (mwScript) and user-interface builder, allowing you to extend functionality, automate repetitive tasks and refine how MoneyWorks interacts with the user. Automate repetitive tasks by adding new menu commands and/or buttons on lists and entry windows. Communicate with external websites to look up supplier pricing, extract exchange rates, get the latest stock market quotes etc. Add special functionality, such as customised price books, special discount rules and automatic transaction creation. Provide enhanced data integrity checks and workflow management, such as custom purchase order approval. Design your own list or entry windows, or extend existing windows. Access external data sources in real time, or read and massage unstructured text files. Exchange data with other MoneyWorks files, even when stored on remote Datacentres. mwScript, the simple but powerful scripting language, is cross-platform and easy to use, even for novice programmers. Scripting editor is colour-coded for live syntax checking. mwScripts have access to MoneyWorks tables and functions. Event driven for easy integration with user interface. Scripts can display simple alerts and custom designed list or input screens. Individual scripts can be enabled and disabled as needed. Access to special user tables for storing persistent data within MoneyWorks. mwScript incorporates a rich subset of CURL for easy communication with other on-line systems, as well as functions for JSON parsing and BASE64. mwScripts can be easily imported and exported, for quick deployment. Managing your inventory is easy with MoneyWorks, with the complex accounting required for inventory being handled automatically whenever you make a stock purchase, sale or requisition. The stock-take feature simplifies physical stock-takes, and there are special transaction types for stock revaluation, creation, write-offs and manufacturing. MoneyWorks also seamlessly handles negative inventory and kits/bills of materials, and can reorder based on supplied minimum stock levels and unfulfilled orders. Extract, number crunch and report on your valuable accounting and sales/purchases in almost any way that you want. With more than 100 standard reports and dashboards, MoneyWorks Gold probably has your reporting needs covered. As well as doing traditional financial reporting, powerful planning tools are included, such as the 15 month Cash Forecast, which is calculated according to assumptions that you provide. But we recognise that we can't anticipate every reporting need, so MoneyWorks Gold includes two powerful report writers, enabling you to number-crunch almost any data in your MoneyWorks file in any way, and present it in a format that suits you. You can even get data from external data sources, including websites and sql databases1. 1A free extension is available to access mySQL databases. MoneyWorks has built-in tools that make highly customisable and able to do so much more than just bookkeeping and accounting. As well as tools for creating your own reports, forms (invoices, labels etc), and dashboards, MoneyWorks Gold includes a powerful scripting language that allows you to extend its functionality. This, and the capability to interoperate with other systems, both on your desktop and in the cloud, makes MoneyWorks the most flexible and cost effective accounting/business solution for small-medium enterprise. Record payments and receipts and automatically track the GST. Maintains details of your accounts for over 7 years. Easily view balances and trends for accounts, customer or item sales. A library of over seventy standard reports. Store customer and supplier names, addresses, phone numbers, email & web addresses. Enter sales and purchases using account coding or item lookup with quantities and discounts. MoneyWorks provides the best possible support for tax. All the better to remember you by. Full budgeting for better control and decision making. Keep accounts for as many entities as you need. Record information and prepare invoices/reports in almost any language. Easily record all your payments & receipts. Clear entry screens make for fast, accurate recording of transactions. Import downloaded bank statements in QIF, OFX, QBO formats. Automatic allocation of income and expenses by predefined rules. Recurring transactions save re-entering repetitive items such as rent and wages. Print cheques or create electronic direct payment files for supported banks. Manage as many bank or credit card accounts as you need. Point and click bank reconciliation—no need to re-enter your bank statement. Full bank register and cashflow reporting. 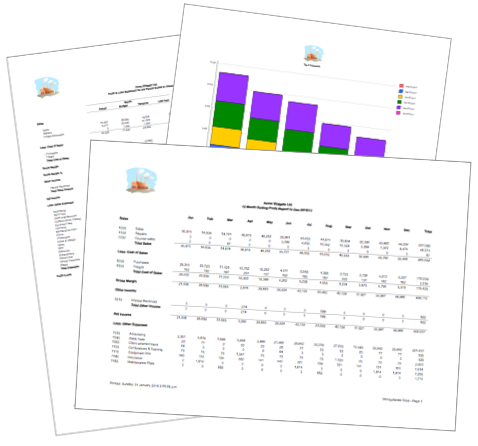 Produce professional profit & loss reports for month, year, multi-year comparison, budget and more. Maintains details of your accounts for over seven years, right through to trial balance and balance sheet. Completely flexible chart of accounts allows MoneyWorks to operate the way your business does. Seven character free-form account codes for reporting flexibility. Journals (including reversing journals) for managing account transfers and accruals. Account movement graphs with drill-down to actual transactions. Comparative reports and graphical analysis going back seven years. Supports alternative code for reporting. Use your own codes in-house to provide the degree of breakdown that you need, but give your accountant reports based on their preferred coding structure. No end-of-month or end-of-year rollover—have up to 90 periods open simultaneously. Complete audit trails for added accounting integrity. The extended general ledger in MoneyWorks Gold/Datacentre supports full departmental (cost-centre) accounting. Use departments to manage branches, divisions, vehicle fleets, properties etc. Report by department, group, classification or consolidated. MoneyWorks stores your valuable customer and supplier details and contact information in easily manageable lists, which can be easily searched and sorted. Use these to reliably identify contacts, perform sales analyses, prepare mail/email merge letters and more. Use alphanumeric customer/supplier codes (up to 11 characters) for accurate access to customer names, address, phone, emails etc. Store banking information for creating deposit slips or direct credit files. Create as many contacts as you need per customer/supplier, and assign roles for easy management. Bulk email to contacts selected by role. Assign tax overrides to ensure correct tax handling for unregistered or out-of-state/overseas customers/suppliers. Import and update contact from Address Book (Mac), or from text files. Store URLs for quick access to supplier web sites. Assign default allocation general ledger codes to speed up recording of service transactions. Colour code your contacts for easy access. Assign customer categories and use to analyse your sales (or purchases). Record dates and details of customer/supplier calls, and set automatic reminders to follow-up. Create name templates for easy setup of new or casual customers. 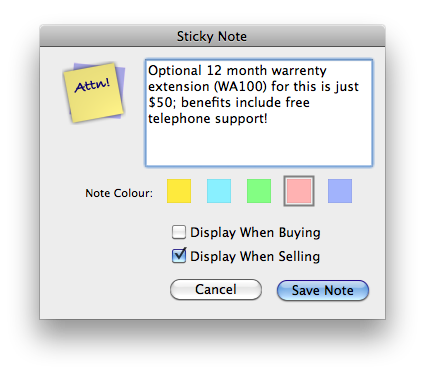 Attach sticky notes to customers (or suppliers) which will appear automatically when you make a new sales transaction. Print address lists & mailing labels, envelopes, merge letters1 etc. 1Creating merge letters and postcards requires the MoneyWorks Forms Designer, which is available in MoneyWorks Express and Gold. Most accounting software allow you to only manage accounts for one company, or charge you extra for additional companies. 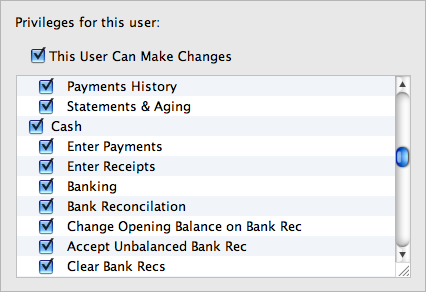 The desktop1 version of MoneyWorks allows you to keep accounts for as many entities as you want on the one computer, with no additional fees or licenses required. Run as many sets of accounts as you require on the one computer with no additional licensing fees. Each set of accounts is kept as a separate file, allowing you to easily separate information from different entities. Keep accounts for organisations with different structures, or even, with the international version, from different countries. Have more than one file open at a time, allowing you to copy and paste transactions between entities [not supported for Gold clients]. All MoneyWorks versions are localised or self-localising for GST/VAT systems in New Zealand, Australia, Canada (including support for provincial sales taxes, HST, QST), Eurozone, Nepal, South Africa, Singapore and the UK, and for sales-tax tracking in the US. Although designed for business use, MoneyWorks is also great for home accounts. MoneyWorks Datacentre allows scripted consolidation across multiple sets of accounts. 1Desktop versions include Cashbook, Express and Gold, as well as Datacentre that is hosted on your own hardware. Hosted copies of MoneyWorks by external hosting companies may charge a per-file fee. Full budgeting—with two separate budgets. Easily compare actual performance to budgets in on-screen enquiries. Use the built-in budget editor to enter and manipulate budget data. Copy and paste budget data from an external spreadsheet. Import/update budgets from text file. Full departmental (cost-centre) budgeting in MoneyWorks Gold/Datacentre. Extensive set of reports for budget vs actual and revised forecasts. Tax handling is simple in MoneyWorks, and is normally done automatically when a transaction is entered. Enter amounts as tax inclusive or exclusive—MoneyWorks does the rest. Default tax is based on general ledger code used, so you never need to worry about charging tax on wages or other exempt/free items. Tax code override for individual customers or suppliers (useful for offshore or out-of-state transactions). Complete handling of GST/VAT on payments/cash basis (invoice/accrual basis available in MoneyWorks Express/Gold/Datacentre). Tax handling is based on 'transaction tagging', so you never need worry that a transaction has been omitted or double-counted. Guide forms available for a number of jurisdictions to help complete tax documentation/returns. Detailed reporting provides complete audit trail. Easily set up items or services that you regularly buy/sell as products, allowing you to specify quantities, maintain consistent pricing and perform extensive sales reporting and analysis. Keep a price book of products or services sold or purchased. Ensure consistent pricing with item buy and sell prices. Maintain an automatic count of the items that you have on hand. See who has (or hasn't) purchased which items. Use product codes of up to 31 characters. Assign categories to items and use to analyse your sales. Attach sticky notes to your products, which will appear automatically as prompts when you make a new sales/purchase transaction ("Would you like fries with that?"). Print price lists, report on top selling products, view sales trends, analyse sales by item category, customer, region etc. MoneyWorks Gold/Datacentre has enhanced product features including pricing matrix, full inventory accounting, serial/batch tracking, multiple-warehouses and bills of materials. Sticky notes act as on-screen reminders in the day to day use of MoneyWorks. Another example of one the many incredibly useful features that make MoneyWorks a stand-out product. Attach a sticky note to a record, and it will pop-up as a reminder when you view the record, or use the code identifying that record. If a customer (for example) has a sticky note on their record, it will pop-up whenever you sell something to that customer. Sticky notes can be attached to transactions, customer/suppliers, accounts, items and job records. Have different sticky notes appear for purchase or sales transactions. Colour code your sticky notes to indicate importance. On an item: use to up-sell ("Would you like fries with that?") or remind about required ancillary products. On a customer: use to remind about bad credit, outstanding issues or for customer relations ("Ask about John's new baby"). On an account: use to provide guidelines on when to use and not use the account. On a transaction: use to annotate why it was coded differently, or why it needs to be checked. On screen enquiries are a great way to get instant access to your valuable data. See historic balances, view sales (or purchasing) trends, and find out what makes your business tick. Separate on-screen enquiries of accounts, products, customers/suppliers. See general ledger balances for an account or range of accounts. Display budget values to monitor performance. View product sales, costs and quantities for a nominated selection of items. See sales value (or purchases) for a nominated selection of customers. 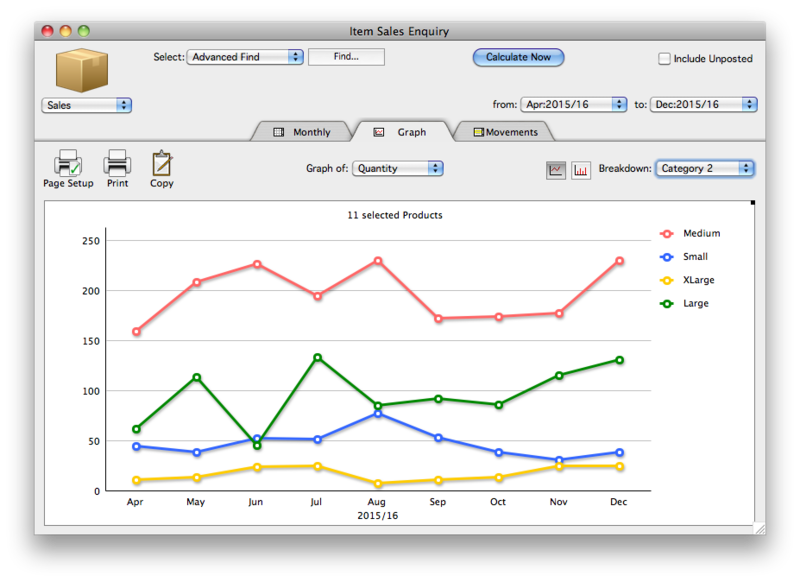 Segment charts by item or customer category to view comparative performances. Drill down to transaction level data to see what makes the values displayed. See trends by enquiring on a range of periods—up to seven years is available. Languages include Chinese, Japanese, Greek, Cyrillic and most other non-Roman text, with the exception of right-to-left scripts (e.g. Arabic). Unicode also provides full cross platform support (Windows and Mac) for accented characters (bonne idée, Māori) and other special symbols. Because an accounting system is only as good as the information you can extract, MoneyWorks comes with a large number of useful reports, each of which can be prepared in a multitude of ways. Comes with Trial Balance, Income, Cashflow, Tax, Cash Projection, Ledger and Balance Sheet, plus profit, trading, inventory, sales, job and budget reports. Easily see what makes the numbers by drilling down to underlying transaction data. Dice and slice your reports: most reports can be run on subsets of data, condensed, or summarised by different criteria. Model and forecast your cashflow [MoneyWorks Gold]. Analysis reports will analyse your transaction data (e.g. see who has purchased what, what regions are products selling into). MoneyWorks Express and Gold allow you to modify/create analysis reports, so you can extract just the data you need. MoneyWorks Gold includes a powerful report writer, allowing you to modify/create virtually any financial or management report. Need on-demand access to multiple files by multiple users, or access from remote sites or mobile devices? Then you’ll need to consider MoneyWorks Datacentre. Provides 24/7 access to multiple MoneyWorks files by multiple users on demand. Allows access for custom apps from mobile devices, such as iPads or smart phones. Looking for a cloud solution? Then you’ll need to consider MoneyWorks Now. MoneyWorks Now has the features of MoneyWorks Datacentre, but is hosted in the cloud.